Interventional Cardiology procedures continue to expand and can include coronary and peripheral angioplasty, stenting, mitral clip device implantation, ASD occluders and even placement of aortic grafts. EncaptureMD stays current with all aspects of cath lab procedures both coronary and peripheral. It integrates with all the major hemodynamic systems. Combine EncaptureMD Interventional Cardiology with inventory and scheduling, interface with your hemodynamic system and tie in to our PCI registry module and utilize our analytics packages for a complete informatics solution. Click on the images below to zoom in and see the detail. Our Visual Coronary Tool allows the clinician to create a diagram to describe the coronary anatomy in a meaningful way to surgeons, non-cardiologists and the patient. The tool also generates the text for the report, allows for a Syntax score calculation and even the PCI registry. Native vessels, bypass grafts, lesions, and stents can all be represented. Many hemodynamic systems have nursing documentation built in, but it only minimally integrates with the physician note or the registry. EncaptureMD's combined work flow allows each staff member to work together in the same system. 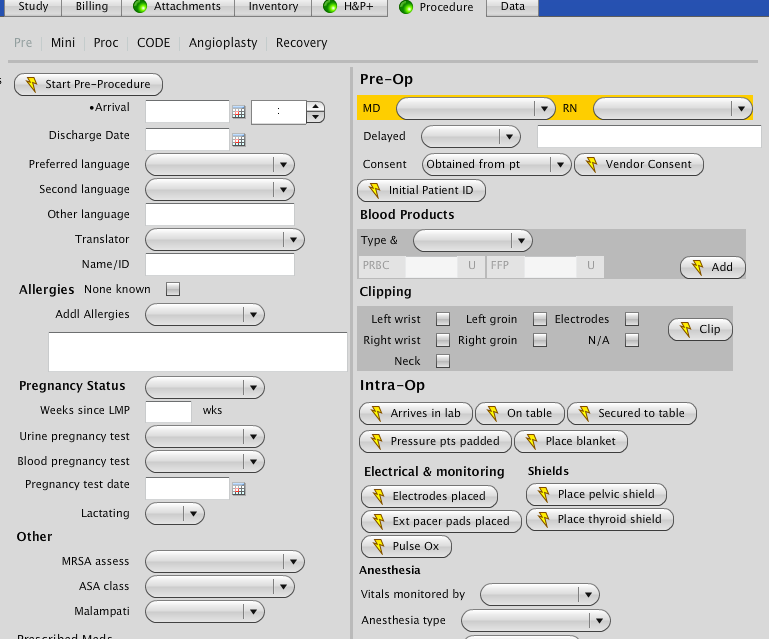 EncaptureMD not only supports coronary and cardiac work, but also peripheral cases of all kinds using a powerful, yet simple to use report interface. Include fluoro images or use our diagrams to communicate disease and intervention.